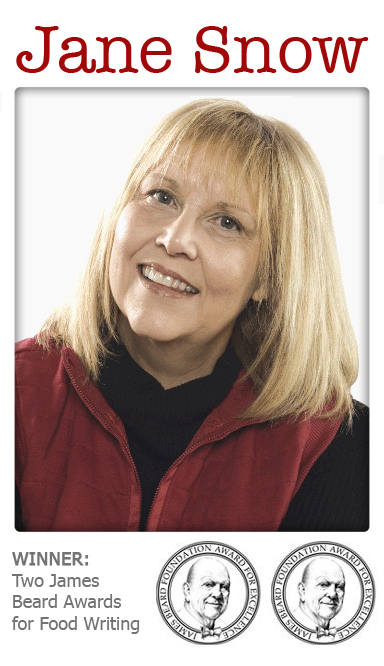 See Jane Cook is a free weekly Internet food newsletter written by Jane Snow and published by Mimi Vanderhaven. Sign up at www.janesnowtoday.com to have newsletter appear every Wednesday (well, sometimes Thursday or Friday) in your email in box. Join us! The Japanese have a ferocious sweet tooth, and I’m seduced by the desserts and snacks every time I visit the country. Acres of real estate in shopping malls are devoted to gorgeous displays of sponge cakes topped with whipped cream and fruit, pound cakes in crinkly pastel wrappers and custards sold in clever pint creamery jars. The candy and cookie aisles in supermarkets take up more space than meat, and almost as much as seafood. I held out against the fancy cakes and custards, but I couldn’t resist the ever-present stash of cookies my mother-in-law keeps on the low dining table in her living room. The table is the center of family life. It is where people sit to watch TV, entertain guests and eat meals. It is where I fell in love with ginger and peanut cookies. Both are called “senbei” rather than cookies. Senbei are rice crackers. The cookies do not taste like they’re made from rice flour, however. They are thin and very crisp. The peanut cookies look as if they are made from a batter, with scenes imprinted on one side. The ginger cookies are also thin and crisp, but they are folded, pinched in the middle and encrusted with candied ginger. The ginger flavor is explosive. I brought some of each back home for a friend who had tasted and loved the cookies my mother-in-law shipped to me last year. Shamefully, I ate the gift cookies instead of giving them to my friend. I couldn’t resist. Now, almost two months later, I miss the cookies a lot. I have no idea how the peanut cookies are made. The ginger cookies appeared easier to replicate, so I gave them a try last weekend. 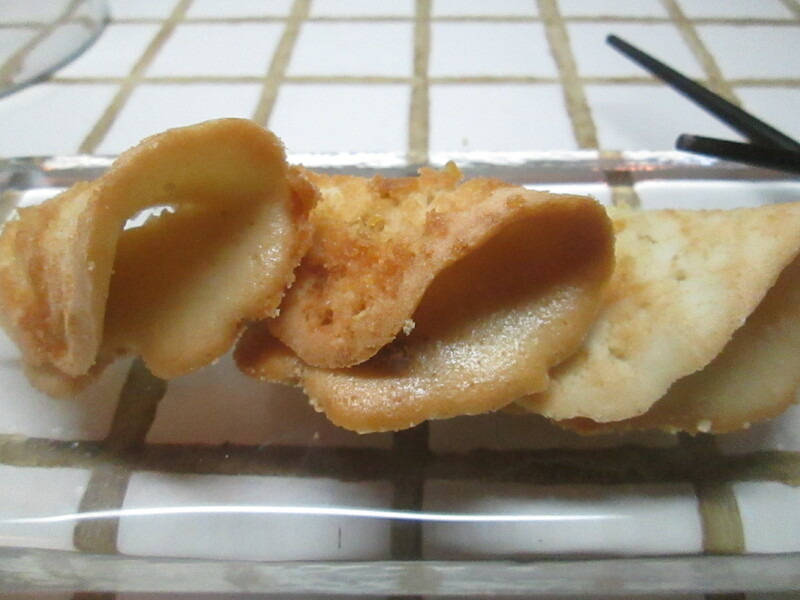 While the cookies I produced are not exactly like the ginger senbei of Japan, they are crisp and very ginger-y. They are nothing like the ginger cookies sold here. I think they would make a wicked dessert paired with pear sorbet. I can’t say for sure because I ate every last stinkin’ one. Preheat oven to 300 degrees and line 2 large baking sheets with parchment paper. In a mixer bowl, combine flour, sugar, powdered ginger, cornstarch and salt. In a small bowl, whisk egg whites until foamy. Whisk in oil and vanilla. Slowly add egg mixture to flour mixture, beating with the mixer until smooth. Spread the candied ginger in 2-inch circles on the parchment paper, 2 inches apart. Eight or 9 circles should fit on each sheet. Use all of the candied ginger. Drizzle a tablespoon of the batter over each circle of candied ginger. Place the first sheet in the oven while finishing the second sheet. Bake about 15 minutes, switching top sheet to lower rack when first sheet is done. The edges should be evenly brown, but the cookies should still be soft enough to fold. The moment the cookies come from the oven, release a cookie with a spatula from the parchment paper and fold in half loosely. For a more authentic look, press a finger in the center of the open edge, allowing the edges on each end to remain open. Continue with remaining cookies, working quickly. Remove second sheet from the oven and fold as before. Cool completely, then return to oven and bake an additional 20 minutes at 300 degrees, until very crisp and dry. Makes 16 to 18 cookies. Those who like to make an extra pie or two to freeze during apple season usually want to know whether it’s best to bake the pie before freezing. Fruit pies may be frozen either way, according to “Farm Journal’s Freezing and Canning Cookbook,” by the editors of Farm Journal. Baked fruit pies should be taken from the oven about 15 minutes early. The crust should be light brown. Cool, wrap well and freeze. Before serving, thaw the pie in its wrapping at room temperature for about 30 minutes. Unwrap and bake at 350 degrees for about 30 minutes, or until warmed through. To bake frozen uncooked pies, unwrap (no need to thaw) and bake on the lower the oven shelf at 450 degrees for 10 to 15 minutes, then complete the baking at 375 degrees. The time will vary depending on the type of fruit. My grandmother taught my mother how to make German meat dumplings, at least that’s what grandma called them. They were wonderful. All who knew the recipe has passed and the recipe was never written down. I remember parts 5 pounds hamburger, a couple loaves of white bread that was torn the night before to dry out, chopped onions, and either sage or poultry seasoning. I remember my father telling my mom that “it wasn’t enough bread and to keep adding more.” There were 7 of us, may have been a frugal thing. I remember mom getting beef bones from the butcher, roasting them and making the best beef stock ever. We would squish all the ingredients together and form into baseball sized balls. They were dropped into the beef stock and cooked gently until done. Served in a bowl with some of the broth. I’ve tried to recreate but the recipe seems to be missing something. I’ve googled “German meat dumplings” and “German meatballs.” No luck. Hopefully someone who has a German grandma makes these and/or passed the recipe on. I would be grateful for any help! My Grandmother was German but didn’t make anything like that. I hope someone can help. As a kid (8 to 14) growing up in Clermont County in southern Ohio, I remember our pawpaw tree. It grew on the corner of our property. My mother would actually wait for them to become ripe. Unfortunately, so would our mailman. Usually, he won. I don’t remember getting to eat very many of them, but I do remember the banana flavor. As soon as I find a tree I’m going to plant it and hope I live long enough for the tree to grow, thrive and produce fruit.